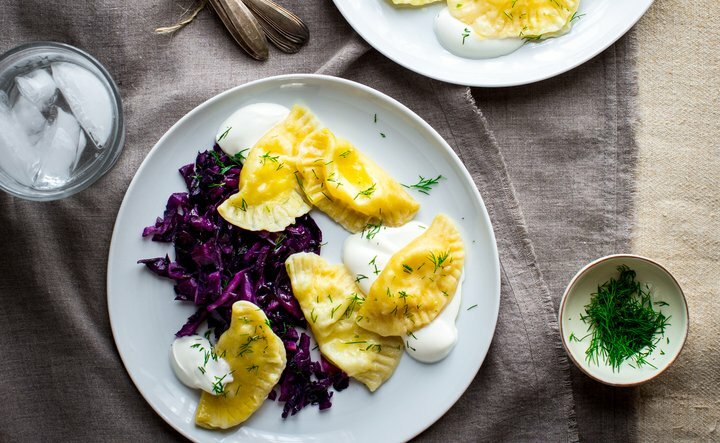 If you enjoy dumplings, whether for an appetizer, a lunch or even a snack, you’re going to love these flavorful cheese dumplings. They conveniently freeze very well, so you can make a batch or two and store them in the freezer to easily grab and heat up whenever you get a craving for them! These cheddar cheese dumplings can also be pan fried in butter after they boil in the last step, giving them a slight crispness to go with the gooey filling. We recommend serving them warm with the cheese still soft on the inside and with a side of Cabot Sour Cream. Try them out and then share the recipe with friends and family on Facebook, Pinterest, Instagram, and Twitter! To make the dough: Combine the flour, eggs, room temperature Cabot Unsalted Butter and salt in a food processor, bowl of a stand mixer or by hand in a large bowl and mix until the dough has the consistency of wet sand. Then add the water and mix until a workable dough is formed. Transfer the dough to a lightly floured surface and knead until smooth, about 2 minutes. Place in a bowl and cover with a damp, cotton towel or plastic wrap and let rest for 30 minutes. To make the filling: Melt the Cabot Unsalted Butter in a skillet over medium heat and cook the onions until they just start to soften, about 5 or 6 minutes. Remove from the heat and let cool slightly. Place the onions in a mixing bowl and add the grated Cabot Seriously Sharp Cheddar, Cabot White Oak or Cabot Alpine Cheddar cheese, salt and pepper and mix until well blended. Set aside. After the dough has rested, divide it in half and place one half on a lightly floured work surface and keep the other half covered in the bowl. Roll the half you are working with into a very thin sheet, about 1/16 inch thick. Using a 3 inch to 3½ inch floured cookie cutter or the rim of a glass, cut out circles of the dough. Save the dough scraps and add to the dough left in the bowl. Place two or three teaspoons of the cheese filling in the center of the circles and fold one side of the dough over the filling to form a half circle. Seal the dumplings by pressing the edges together with your fingers (you can also help seal them by pressing the edges with the tines of a fork). As they are done, place the dumplings on a lightly floured baking sheet and repeat this process with the remaining dough and scraps until either all of the dough or all of the cheese filling has been used. Bring a pot of salted water to a boil. Carefully drop 3 or 4 of the dumplings into the pot and gently stir to prevent them from sticking. Cook for about 4 or 5 minutes, or until they float to the top. Using a slotted spoon, remove the cooked dumplings and put them in a colander to drain for a few seconds and then transfer to a bowl. Repeat this until all the dumplings have been cooked. Add the two tablespoons of cut butter to the bowl and, as it’s melting, gently toss to coat the dumplings. Serve with a generous amount of Cabot Sour Cream! For another cheddar dumpling recipe you’ll love, try this flavorful Eggplant & Chickpea Stew with Cheddar Dumplings. Cabot is a co-operative of over 800 farm families who continuously strive to produce the best dairy products around. If you love these cheese dumplings as much as we do, we’d really appreciate it if you could rate and review the recipe when you have the chance! COMBINE the flour, eggs, butter and salt in a food processor, bowl of a stand mixer or by hand in a large bowl and mix until the dough has the consistency of wet sand. Add the water, and mix until a workable dough is formed. Transfer the dough to a lightly floured surface and knead until smooth, about 2 minutes. Place in a bowl and cover with a damp, cotton towel or plastic wrap and let rest for 30 minutes. MELT the butter in a skillet over medium heat and cook the onions until they just start to soften, about 5 or 6 minutes. Remove from the heat and let cool slightly. Place the onions in a mixing bowl and add the cheese, salt and pepper and mix until it is well blended. Set aside. AFTER the dough has rested, divide it in half and place one half on a lightly floured work surface and keep the other half covered in the bowl. Roll the half you are working with out into a very thin sheet, about 1/16 inch thick. Using a 3” to 3½ inch floured cookie cutter or glass cut out circles of the dough. Save the dough scraps and add to the dough left in the bowl. PLACE two or three teaspoons of the cheese filling in the center of the circles and fold one side of the dough over the filling to form a half circle. Seal them by pressing the edges together with your fingers. You can also help seal them by pressing the edges with the tines of a fork. As they are done, place the dumplings on a lightly floured baking sheet. Repeat this process with the remaining dough and scraps until either all of the dough or all of the cheese filling has been used. BRING a pot of salted water to a boil. Carefully drop 3 or 4 of the dumplings into the pot and gently stir to prevent them from sticking. Cook for about 4 or 5 minutes or until they float to the top. Using a slotted spoon remove the cooked dumplings and put them in a colander to drain for a few seconds and then transfer to a bowl. Repeat this until all of the dumplings have been cooked. Add the two tablespoons of cut butter to the bowl and, as it is melting, gently toss to coat the dumplings. Serve with lots of sour cream.